Everything you need for a complete piston maintenance equipment, including singles and twins. If you're looking to set up a maintenance shop, this will do a darn good job of getting you going. We'd prefer to sell it as a package, but individual items may be available. Package price: $27,500. We also have a complete shop parts inventory to go with it. 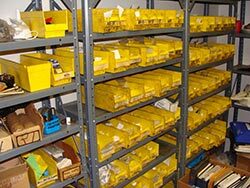 Over 31,000 parts including nuts, bolts, washers, O-rings, lamps, plugs, filters, hoses, tires, gaskets, screws, clamps, rivets, grommets, cotter pins, etc. Package price, $25,000 at wholesale cost. Complete inventory listing available upon request. 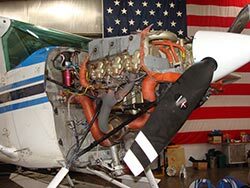 HANGAR FOR SALE in Manitowoc, WI (KMTW). Prime location next to FBO. Only 3 years old. 81' x 120' (nearly 10,000 SF), heated, 55' x 15' Schweiss bi-fold door with remote door opener. 3 service entry doors, overhead garage door, security system, emergency lighting, natural gas forced air heat. City water and sewer available. Perfect for your collection or an investment. Current rent-paying customers could continue if desired. $275,000. For more information, please contact Curt Drumm at 920-901-2200, or cdrumm@lakeshoreaviation.com.